Product #6628 | SKU MHB-350 | 0.0 (no ratings yet) Thanks for your rating! Hosa MHB-350 8-Point PatchBay Module. 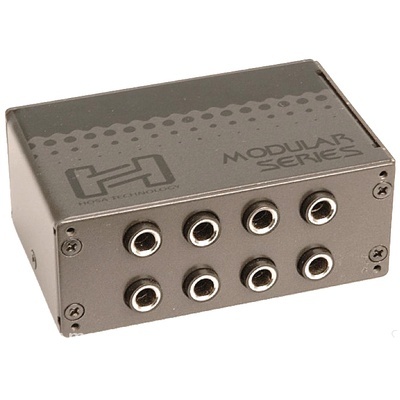 The MHB-350 Patch Bay Module by Hosa Technology provides 8 channels of balanced 1/4'' phone throughput for any situation. It is ideal for routing balanced signals to and from mixers, recorders, and outboard gear. Hosa’s Modular Patch Bays are designed for use as either stand-alone units or mounted in a PPP000 Patch Bay Module Rack Frame as a component of a multi-function patch bay. The PPP000 (sold separately) holds up to 4 modules and fits any 19-inch rack.